Dr. Ekman served as Scientific Advisor to the show. He analyzed and critiqued each episode’s script and taught the cast and crew about the science of deception detection. The main character, Dr. Cal Lightman, is loosely based off of Dr. Ekman. 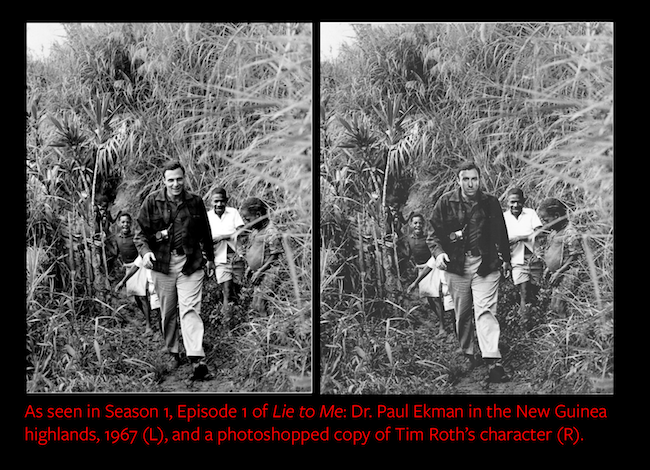 Many of the episodes of Lie to Me feature references from Dr. Ekman’s own experiences. While much of Dr. Ekman’s research informs Lightman’s character, the personal aspects of Lightman’s character are not based on Dr. Ekman. For instance, Lightman is British, divorced, and has a strained relationship with his one child. Dr. Ekman is American, has been happily married for over thirty years, and has a good relationship with his two children. 1. What was Dr. Ekman’s role in in the FOX TV show 'Lie to Me'? What did he think about the show? Dr. Paul Ekman was the Scientific Consultant for ‘Lie to Me’. Because the show was expressly created for entertainment purposes, it is important to Dr. Ekman that people understand the difference between fact and fiction. 2. How true/real is the science in 'Lie to Me'? Obviously the show ‘Lie to Me’ was meant for entertainment. However, it is most important to Dr. Paul Ekman that people understand the difference between fact and fiction. You can find his critique of each episode here. There is no such job listing as “lie detector” but you can utilize this skill in most jobs where you are required to work with people. 3. How do I become a lie detector like Dr. Cal Lightman on 'Lie to Me'? Many law and security enforcement professionals benefit from these skills. Teachers use the skills to better understand their students. Doctors and other medical professionals may need to know that their patients are telling them the truth so that they are able to diagnose them quickly and safely. Sales personnel find these skills useful in gaining sensitivity to clients’ needs. Managers are able better understand their employees.